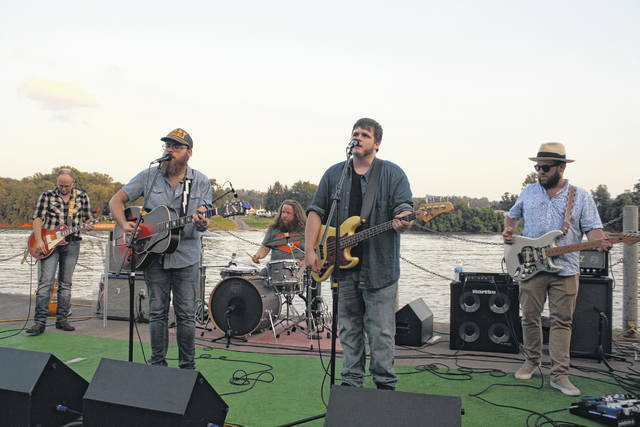 With the Ohio River in the background, Jake Dunn and the Blackbirds performed the fourth of five shows for the Rhythm on the River concert series sponsored by the Pomeroy Blues and Jazz Society. Dunn, a Meigs High School graduate and Pomeroy native and his five piece band, plays a cross between Americana and Roots Rock, along the lines of the new superstars of music like Jason Isbell, Sturgill Simpson and The Drive By Truckers. Dunn and the Blackbirds has earned a strong regional following in Southeastern Ohio and West Virginia, playing from Columbus to Charleston. Next week, Ohio native and Arizona resident Bill Dutcher will play the final Rhythm on the River Show preceding the Big Bend Blues Bash on July 27th and 28th. Dutcher’s music must be heard to believe, as he becomes a magician of sorts with his hands and six strings. Show time is 8 p.m. at the Pomeroy Riverfront Amphitheater. https://www.mydailysentinel.com/wp-content/uploads/sites/14/2018/07/web1_7.17-Rhythm_ne201871693914200.jpgWith the Ohio River in the background, Jake Dunn and the Blackbirds performed the fourth of five shows for the Rhythm on the River concert series sponsored by the Pomeroy Blues and Jazz Society. Dunn, a Meigs High School graduate and Pomeroy native and his five piece band, plays a cross between Americana and Roots Rock, along the lines of the new superstars of music like Jason Isbell, Sturgill Simpson and The Drive By Truckers. Dunn and the Blackbirds has earned a strong regional following in Southeastern Ohio and West Virginia, playing from Columbus to Charleston. Next week, Ohio native and Arizona resident Bill Dutcher will play the final Rhythm on the River Show preceding the Big Bend Blues Bash on July 27th and 28th. Dutcher’s music must be heard to believe, as he becomes a magician of sorts with his hands and six strings. Show time is 8 p.m. at the Pomeroy Riverfront Amphitheater.